As you know, our shop has a vintage section, and you may easily guess, that we are so very in love with the vintage beauties and treasures. 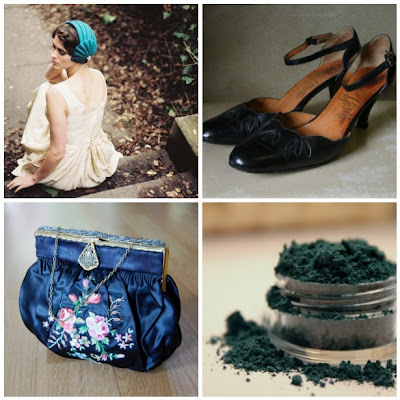 This time I picked a few lovely finds belonging or reminding of the Interbellum, or the Interwar period (between 1918 - 1940) with its luxury of awesome small hats, modest and lovely mary janes, unique hand embroidered glamorous fermoir purses and stunning smoky eyes. It is lovely. I used to have such shoes - inherited them from my grandmother, can you imagine...The purse is gorgeous.